If you have been looking for our web site it no longer exists. It was a hard decision to make, we had become quite attached to the ageing site. To be honest it had been on life support for sometime, the number of patches it required to keep the ‘ailing body’ secure was taking up to much time. So at the end of the month we allowed it to pass away…quietly! Now that it has gone we have more time to concentrate on the work we do. It just go’s to show what a lot of time was wasted on keeping it! We now have time to do the repairs,write and think what we would like to post on the blog again! From what I understand, the only people that are really missing our presences are the scammers and hackers. They no longer have email addresses that they can fill with rubbish that wasted someone’s time to delete everyday! … it was no surprise that the person who looked after this side of things took all of us out for a drink to celebrate! We were warned that it would impact the business big time, but as yet we have not seen a drop in sales, if anything the phones are ringing more. Life has become simpler and healthier. So what next! a new web site? All in good time, you may see a new one. At the moment we are enjoying the freedom, it allows us to concentrate on our customers more. A big plus for our second to none service we already provide. Don’t forget you can still get in touch on twitter @plasweld1 or you can find our founder Mitch on Facebook. We are happy to take questions on both sites. You will also find lots of images of the repairs we have done. 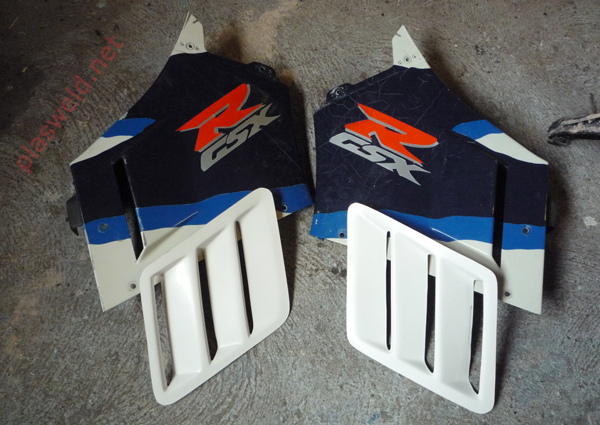 We were asked to customize some Suzuki GSXR upper side panels. This a story from warmer times. It was early spring when we had a call from a gent about doing some custom work on a Suzuki GSXR. He wanted to give his side panels that Yoshimura look. 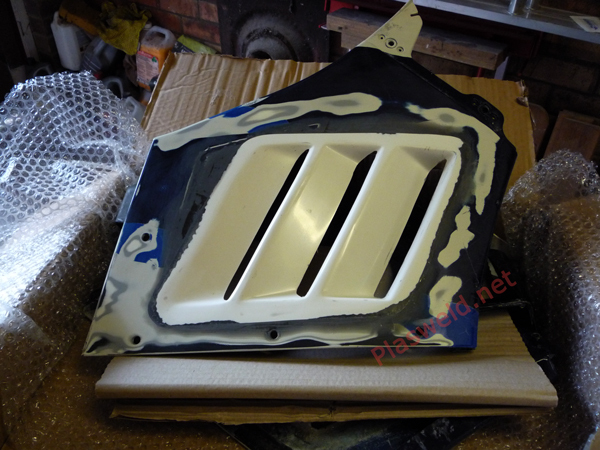 The out line was would we be able to make a series of air vents and weld them into the side panels. I was more than interested as one of my first custom jobs was a GSXR of roughly the same year. So I have a bit of a soft spot for these bikes. Over the weeks that followed it became clear that there was not the budget needed to allow us to fabricate the vents from plastic and weld them in, as the customer wanted. Which was a shame! When it comes to making parts from scratch it is labour intensive. But all was not lost the customer had discovered a set of fibre glass vents that matched what he wanted to achieve and asked us if we would be able to make them fit. After some weeks the vents turned up at the workshop and with a bit of trepidation I opened the package. I have nothing against fibre panels but I have seen some really bad ones. These surprised me, they had a quality finish and looked the same size. On very careful inspection one was slightly smaller than the other and they curved more than the panels they were being fitted into; which in the end lead to an over complicated fitting arrangement. Once the holes were cut to shape in the side panels, some plastic material was cut to fill the gap left by the original vent. Then a lip was cut into the plastic where the new fibre vents would sit. If they had not been made with an exaggerated curve this part of the job would not have been necessary. It took two of us to bond each vent into place. When this was set the vents were then fibre glassed in with a water proof matt to stop weather degradation. When the fibre glass was dry we used a special flexible filler to fill between the two materials to reduce the chance of cracking. It is always nice to hear that the customer is happy with the results especially when it is done long distance. Lets hope there is a change in the weather soon. Flattened and Broken could it be saved. Look away to painful to watch. Extensive damage shown from the inside. heated. Also the material type had to be checked so it could be matched with one of our donor patches. Without this knowledge ‘life support’ would no longer be needed. Fortunately we had a good match, meaning the prognosis was good. In fact when we tested the material it was in excellent health if it was not for the crush ‘injuries’ and missing bits. So we could bring the panel back to full health but it would take time. Damage from the outside. We were told not to rebuild the dummy air vent. Flattend area reformed. Showing missing lug. was done – near on six metres! With a part this badly damaged it’s repair has to be staged so that it did not get over heated. Because of this it spent a lot of time in ‘recovery’. Now that the panel was strong enough it was time to replace the areas that were missing. For this we used brand new plastic. All the parts were cut to a rough size and then tacked into place. Again taking care not to use to much heat. As we worked, it steadily regained its ‘health’. New lug made from plastic. Also shows internal stitching together. Now that the ‘surgery’ was complete the panel was placed in the recovery area to give the repairs time to settle in. Then the brutal task of flattening and shaping the welding and new material would begin. Once done it would be ready for a new paint graft. Rebuilt corner with new plastic. Shaped and scraped. The darker areas show where the new material has been added.